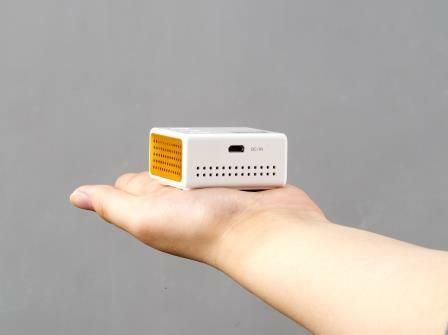 Roman-Shokai Inc. cooperating with TO21COMMS sells the pico projector named ‘Pocket Theater’, which is the smallest and lightest among all Japanese products and has a wireless connection. It can be connected with a smartphone and a computer using Wi-Fi. You don’t consider when and where you project pictures, movies and other data. For example, you can share this data with your friends and family, it is also useful in business like meetings and presentations. This latest product eventually gives you new possibilities of mobile devices. The price of it is discretionary.. Although this size, 52mm(W)-52mm(D)-26mm(H) and approx 70g, is very compact, it has the battery which can play for 2 hours consecutively and the 1.0W speaker. 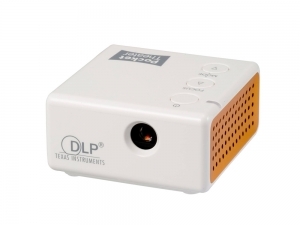 Further, it’s compatible with DLP technology in Texas Instruments Inc., so the vehement distinctness and the brightness at 50ANSI lm are provided. Another feature is that LED is utilized, thus the negative effects for human would be lesser if the light enters eyes. In other words, you can use it with children safely. It also adopt the wide screen, around 10-100 inch. The connection between this projector and other device is easy with ‘Miracast’ or ‘AirPlay’ which are telecommunications standards of wireless LAN, even though there is no exclusive application. And you can’t project only stored images and data in your phone, but also some contents on the website because it can connect with a wireless router albeit using other telecommunication standards.